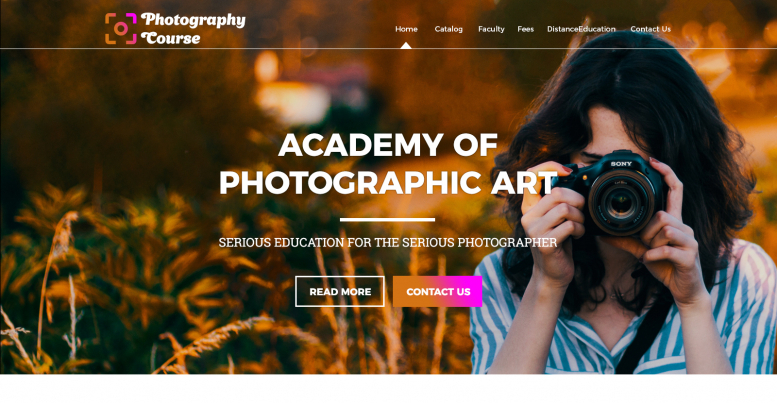 Photography Courses Website Template & Theme For Schools, Institutes. This Photography Course Theme was created using a clean and elegant typography and with close attention to details. The theme is suitable for creating fully functional photography course website. Literally everything in today's world is moving towards the online web presence and educational sphere is a no exception. So in order to promote your establishment and make educational information available and open for as many people as possible you need a professionally-made and eye-catching website. Which is exactly what we offer! A homepage with essential sections and all the corresponding subpages. The homepage of Photography Course Theme Features a large and attractive banner with the read more information contact us link on it. The homepage also features the sections like Blog Post, Latest News, List of Courses and Gallery. The footer is kept simple with link to the social media accounts and to the content pages. $25.00 The simple license would allow you to use the template to create one website.